Scuba diving can be an overwhelmingly beautiful and serene experience, or completely eerie depending on what you are diving into. One of my eeriest dives was in Aruba where my buddy and I swam through a ship that had been hit by a torpedo (first photo). That same day, we ventured into a plane that crashed and sank to the ocean floor. The plane was still surprisingly in tact which made it even creepier. I swam through the emergency exit door and up into the cockpit, the whole time imagining the poor, terrified souls lost. That day I learned that you can in fact get chills 40 feet underwater, in a wet suit, in 80 degree water. The second photo is from cave diving in Mexico. Fun, beautiful, and a little frightening at times! 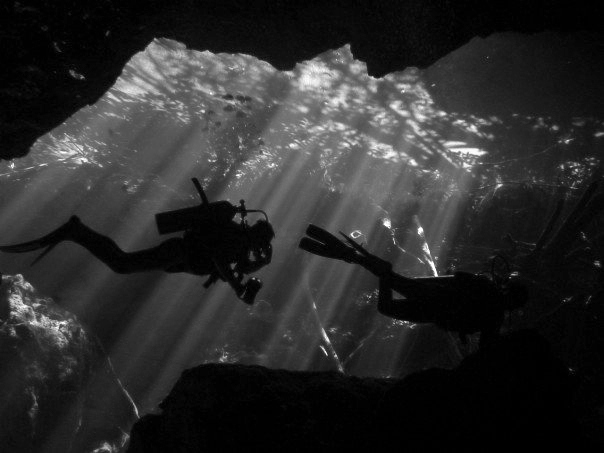 When you are swimming down into the depths of a cave in pitch black water, eerie is an understatement. great shot! I agree with you on the natural eerieness we sometimes find deep down, scuba is one magical moment! Thanks! It is completely magical, and hard to describe if you haven’t done it. Glad you understand! These are very cool. I have to tell you, I could never do that. The thought of scuba diving is very frightening to me. I have a fear of deep water. 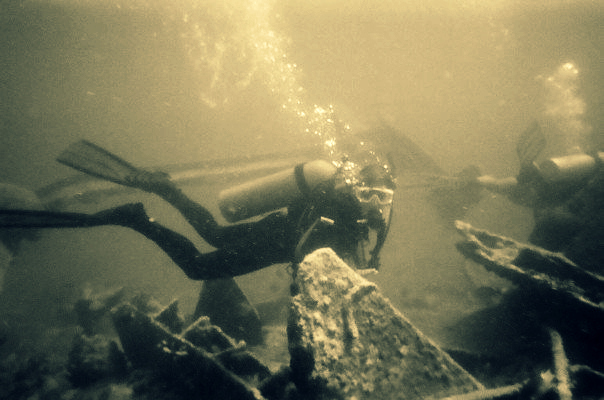 And diving around sunken ships!!!!! I think I would have a heart attack! I admire you for doing that! Thanks! I never thought I would be able to either, honestly. But once down there, something kind of takes over and you are so in awe of how beautiful it is, it’s hard to be scared. Granted, my first ocean dive ever was absolutely TERRIFYING. I think I probably sucked half my tank of air on the descent because I was hyperventilating so much. Just terrifying, haha! Now that it’s been awhile since I’ve been diving, I am more scared to jump back into it, but I hope I do again soon.